We uncover a few more details of the MT-15 just weeks before its official launch. The frame and engine is similar to the Yamaha R15 Version 3.0. India-spec model receives a tyre hugger. The Yamaha MT-15 will be launched on 15th March at the Buddh International Circuit. 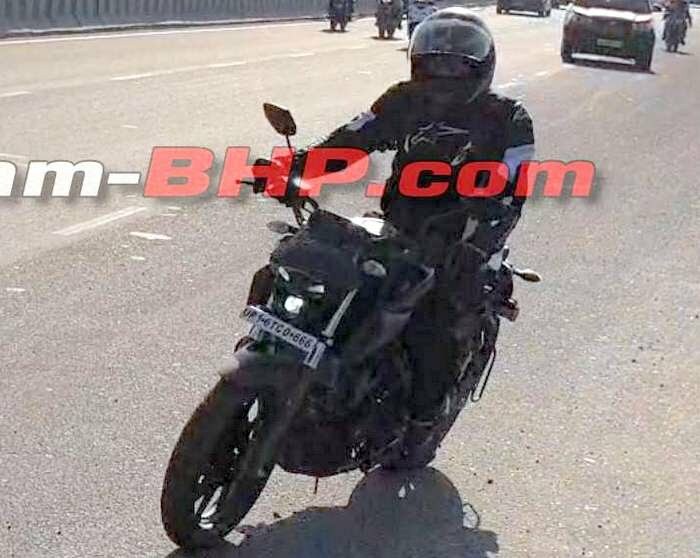 Test mules of the hotly-awaited MT-15 have been spotted yet again before the official launch date of March 15. And this time we have a better view of the bike, which reveals not only the exhaust system but also a front fender borrowed straight from the R15 V3.0. It also features what looks like a grab handle running from the pillion footrest to the rear section of the bike. Not the best-looking design, we’d say. That said, at least the exhaust system is the same as the international spec-version. Coming to the heart of the bike, it employs the same 155cc, single cylinder, liquid-cooled mill seen on the R15 V3.0. The motor is capable of dishing out a maximum of 19.3PS at 10,000rpm and a peak torque of 14.7Nm at 8,500rpm. A 6-speed transmission with a slipper clutch transfers power to the rear wheel via chain drive. Besides this, the bike also features Variable Valve Actuation (VVA) which improves low-end grunt and top-end performance, all while offering better fuel efficiency. The Yamaha MT-15 uses a Deltabox frame with conventional telescopic forks and a monoshock at the rear. Braking duties are handled by disc brakes at both ends with dual-channel ABS likely to be standard. The 17-inch wheels come wrapped in a 110/70-section tyre up front and 140/70-section tyre at the rear. While the R15 V3.0 weighs in at 137kg, we can expect the MT-15 to be lighter since it sheds the front fairing and uses minimal bodywork. In terms of pricing, the MT-15 is likely to be priced between Rs 1.2 lakh to 1.3 lakh, while the R15 V3.0 costs Rs 1.39 lakh (ex-showroom Delhi). Once launched, the Yamaha MT-15 will compete against the likes of the Bajaj Pulsar NS200 (Rs 1.12 lakh), Apache RTR 200 4V ABS R 2.0 (Rs 1.11 lakh) and the Hero Xtreme 200R priced at Rs 89,000 (all ex-showroom, Delhi). Yamaha will be launching the bike at the Buddh International Circuit, which will be followed by media rides, so stay tuned to BikeDekho for our first ride impressions.